The reusable paper bag with your custom logo! 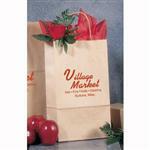 The V Natural Kraft Paper Bag is great for school or trade shows. Sturdy kraft paper lined with coated non-woven polypropylene. Large 8.5" gusset, 24" handles. Recyclable! With a durable kraft paper lining that's coated with non-woven polypropylene, V-Natural™ Kraft Promotional Totes give you more opportunities to make a great impression. Restaurants can forget the throwaway coloring book menus, and car dealerships can forget the balloons that will either float away or go flat within hours. When it comes to eating out or making a decision about a new vehicle, parents of young children truly appreciate establishments that thoughtfully provide ways to keep their kids busy. With a custom imprint on one side, and a colorable surface on the other, V-Natural™ Kraft Totes are ideal promotional giveaways with endless possibilities. It's certainly a doggie bag they won't forget. Available Colors: Black, Brown and Tan trim, paper exterior. Production Times Available: 7-Day Standard Production with Paper Proof. 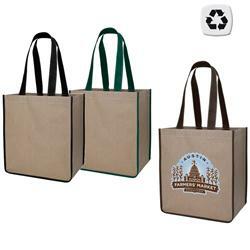 Sturdy kraft paper lined with coated non-woven polypropylene tote bags.